Wedding PR: Huffington Post, Catersource and more! Welcome back! We’ve got a spectacular roundup of client features we have been dying to share! From Huffington Post to Catersource and more. See it all below! 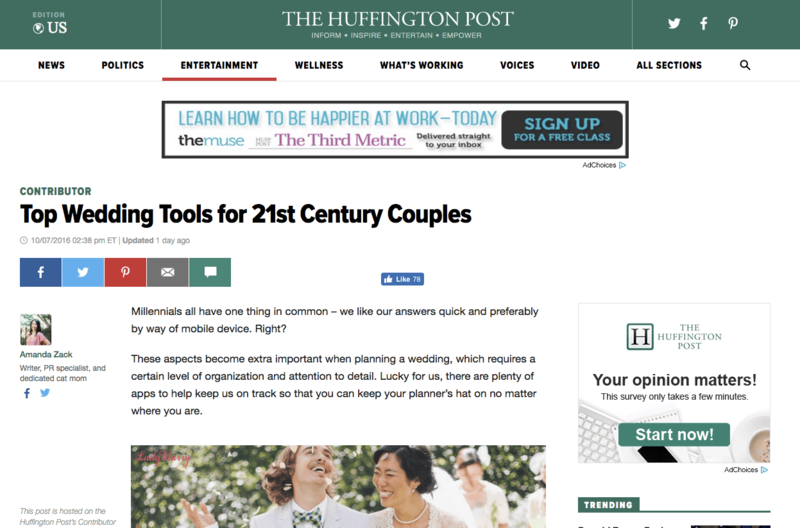 LadyMarry and Passport to Joy were featured on The Huffington Post in the article Top Wedding Tools for 21st Century Couples. See the full article here. Taylor’d Events Group was featured on Special Events with the guest article How to Tap Into your Creativity for Special Events. See the full feature here. OFD Consulting was featured on Honeybook with the guest article Get Educated: Determining the Best Conferences and Workshops for You. See the full feature here. Fantasy Sound Event Services was featured on Catersource with their guest blog Event Lighting: Everything You Need to Know About Spotlights. See the full feature here. Destination Weddings was featured on Catersource with their guest blog Trend Alert: Destination Wedding Excursions. See the full feature here. 100 Candles was featured on WeddingIQ with their guest article Tips for Making the Sale with Add-ons. See the full article here. Destination Weddings was featured on About.com in the article Unique Destination Wedding Locations That Aren’t a Beach. See the full feature here. Taylor’d Events Group was featured on Timeline Genius with the guest blog The Big Day: Not Just About the Newlyweds. See the full feature here. Belladeux Event Design was featured on Catersource with the guest article All Things Linens. See the full article here. Taylor’d Events Group was featured on WeddingWire EDU in their guest blog The Key to Setting Realistic Goals. See the full article here.